Someone on the newsgroups made a very good observation after installing the ATI Catalyst 6.8 drivers. It would appear that after installing the Catalyst 6.8 drivers, including the Catalyst Control Center (CCC), the version shown inside the CCC is still 6.7. Apparently, ATI didn't increment the version shown in the CCC, and by the time they realized this, it was too late to make the change, as the driver package had already gone through the WHQL process. 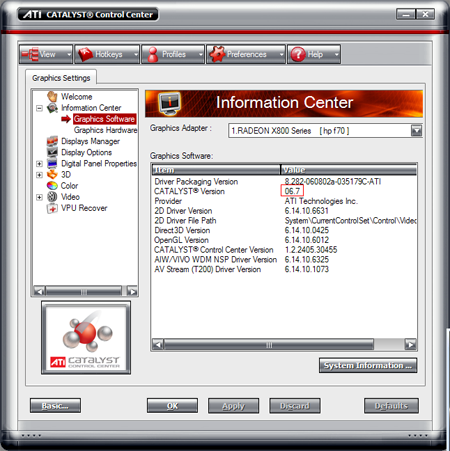 If ATI wanted to make the change, they would have had to go through the certification process again, which would have delayed release of the Catalyst 6.8 driver set by a week. Given that the version display would have been purely comestic, ATI decided to leave things as they were. Thanks to 'djenkins6' from the microsoft.public.windows.mediacenter newsgroup for bringing this up.